Last spring I made an egg garland just like this one, it took just a few minutes to make...this spring I wanted to make a matching one. I thought I'd show you again, be sure to check out the matching egg wreath below too! This is seriously one of the fastest and easiest things I've ever made. Gives a beautiful rainbow-y pop of color around the house. All you do is cut a piece of ribbon on yarn to the length you want plus a little extra...the start clipping on the eggs! Then make a loop or tie a knot for hanging, whatever you need for your specific hanging arrangements...so incredibly fast and easy! 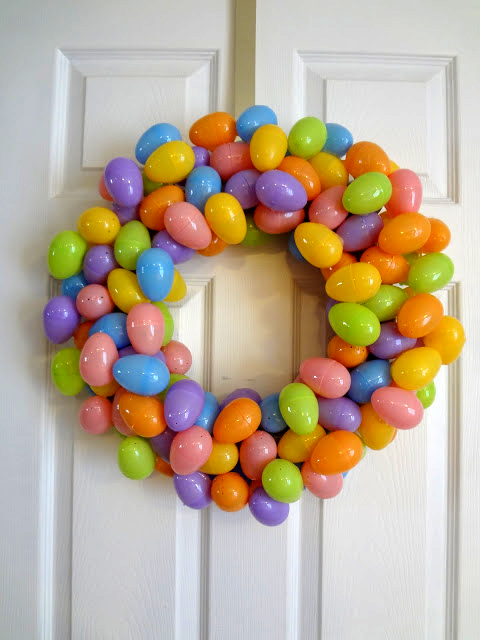 Here's my plastic egg wreath, click here to make one too! So sweet and so pretty! Love the rainbow of colours!